One month ahead of local elections, Binali Yildirim, the mayoral candidate of the ruling AK Party (AKP) for Istanbul, visited a historical mosque to start his campaign on Tuesday. He asked for support from worshippers through an official Muslim religious, which drew rebuff. Yildirim is a well-known political figure in Turkey, being the 27th and last Prime Minister of Turkey from 2016 to 2018 before the country adopted the presidential system. He was also a leader of the Justice and Development Party, but resigned from his post as Speaker of the Grand National Assembly, to sit for mayor of Istanbul last week. Also a former Minister of Transport and Communication, Yildirim headed through Istanbul, from Ankara, with a high-speed train after he passed the baton to a new Speaker in the Turkish parliament. Yildirim’s first stop at the very beginning of his campaign was Eyup Sultan mosque, which is the all-important symbol of Islamic faith in Istanbul, built after the conquest of the city in 1453. 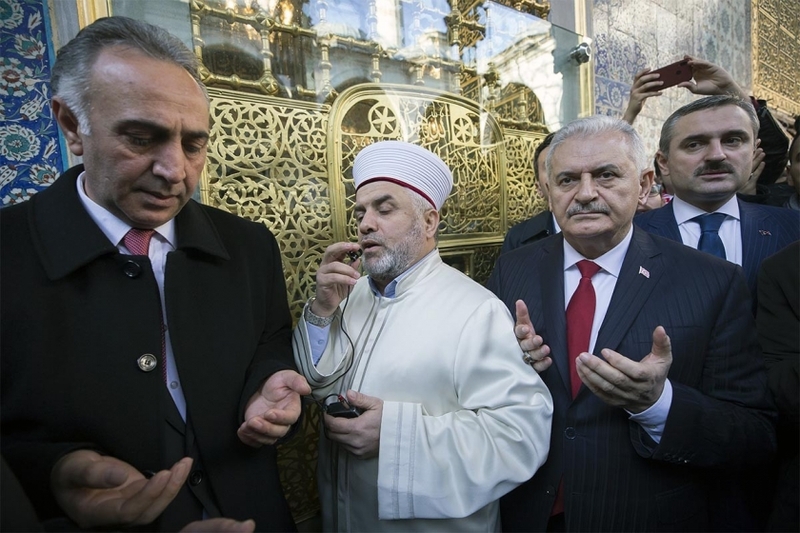 Many Turkish televisions were broadcasting online when Binali Yildirim stood in the yard of the historical mosque, next to an imam, a civil servant who canvassed and asked for support. The imam led a vocal prayer wishing success for the AKP candidate and encouraging citizens gathered at the yard to respond by saying “Amen,” marking clear support in favor of Yildirim. According to an Article in the Turkish Constitution, implemented in 1965, Directorate of Religious Affairs’ personnel, which must remain impartial, are banned from politics – from praising or criticizing a political party. They must treat all sects of society equally. The law says that those who interfere in politics as a religious body while on duty should be investigated or dismissed from their posts. However, Turkey’s President Erdogan and his party have been criticized on many occasions for political interference in mosques and other religious institutions, while also exploiting religion and Islamic issues in their campaigns. The ruling bodies have been blamed for organizing official imams to call for support of policies of the government, such as carrying out operations on Kurds in the southeast or deploying troops to northern Syria. The common sermons, written by Directorate of Religious Affairs, are recited on Fridays – Muslim’s holy day – in 84, 684 mosques in 81 provinces across the country. AKP has also drawn rebuff over these sermons, as they often preach the policy of Turkish government, labeling some dissident groups as terrorists, in parallel with AKP’s rhetoric or praising the performance of the ruling party.